A. Philip Randolph, “A. 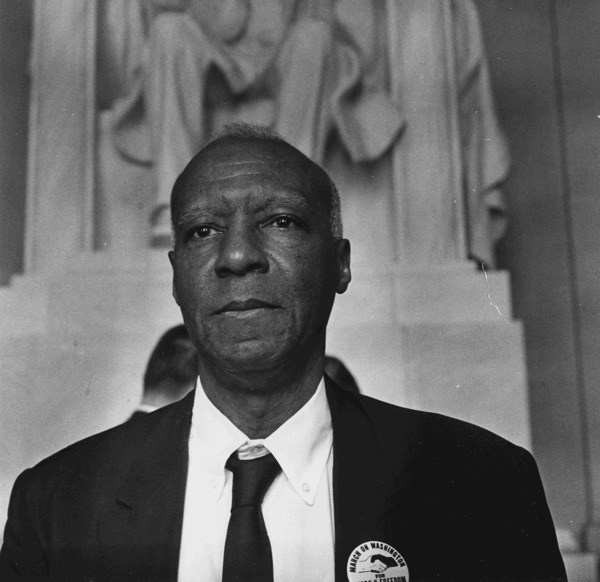 Philip Randolph,” Histories of the National Mall, accessed April 23, 2019, http://mallhistory.org/items/show/97. Civil rights leader and labor organizer A. Philip Randolph built coalitions of African Americans who pressured presidents, Congress, and local governments to end racial discrimination. In 1941, he organized a proposed march on Washington by African Americans to demand an end to racial discrimination in defense industries and the US military, and to ban lynching. Randolph cancelled the march after President Franklin Roosevelt signed Executive Order 8802 establishing the first Fair Employment Practices Committee, effectively banning racial discrimination in defense-related industries in 1941. Randolph continued fighting for equality and marched with other civil rights leaders in Washington in 1963. Asa Philip Randolph was born in Crescent City, Florida, the son of an American Methodist Episcopal minister. His parents stressed the importance of receiving a good education, and both Randolph and his brother attended the Cookman Institute, a prominent African-American high school. He moved to New York City in 1911, where he enrolled in night classes to further his education while working. In 1913, he married Lucille Campbell Green, a graduate of Howard University who owned a beauty salon. Her business income supported his social activism. In New York, Randolph encountered socialist thought and soon joined the International Workers of the World. He saw organized labor and the principles of socialism as a way of facilitating the progress of rights for African Americans. Along with his friend and colleague Chandler Owen, Randolph began to publish the Messenger, a magazine which argued against lynching and World War I, and promoted racial integration and unionization. In 1925, Randolph helped to found the Brotherhood of Sleeping Car Porters, a union for African American men who worked on railcars; both Randolph and the union he headed would become key figures in the civil rights movement of the mid 20th century. As the United States entered World War II, Randolph and other African American labor advocates grew concerned about discrimination in federal defense jobs. Randolph spearheaded the planning effort for a protest march in Washington. Despite pressure from the White House, the activists refused to back down, and the march was only cancelled when President Franklin D. Roosevelt signed Executive Order 8802 which banned racial discrimination in defense contract work. In the 1950s and 1960, Randolph continued to advocate for labor rights and an end to racial discrimination. Working closely with other activists such as Bayard Rustin and Martin Luther King Jr., Randolph served among the leaders of major civil rights movements throughout the country. He lobbied for racial equality behind-the-scenes and through public demonstrations and protests, including the 1958 Prayer Pilgrimage for Freedom and the famous 1963 March on Washington for Jobs and Freedom. He retired in the late 1960s due to ill health.